1. Get rebate or commission when a purchase is made through your ‘url‘. 2. Easily share your ‘url‘ to friends interested to buy Laminine. 3. You can personalize your website ‘url‘ by adding your photo and contact information and start your own online business. STEP 2. Enter and choose ‘My Account’. STEP 3. Scroll down to WEBSITE INFORMATION. STEP 4. Click EDIT if you want to change the name. 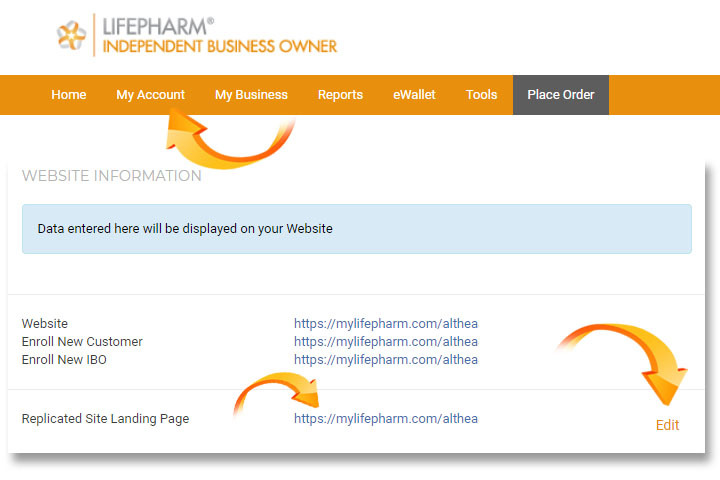 If you signup under Althea Group, we can help you start your online shop. Click here to send us an email. → How you earn by selling LifePharm products. → How to get a discount in the form of rebates, commission, or bonus.